My oldest friend recently asked me to dinner. And no, she’s not 105 – I have known her the longest of all my friends – since kindy! It was one of those serendipitous meals where everything was wonderful – lovely flavours, beautifully cooked, everything hit the right note. The wild barramundi with preserved lemon, crisp potatoes and chilli mayonnaise was amazing. However the piece de resistance was the dessert – Baked Passionfruit Ricotta Flan with Lemon Cream. What was unusual about this flan was that it was more “cakey” than “tarty” with a lovely texture half way between a curd and a cake crumb. 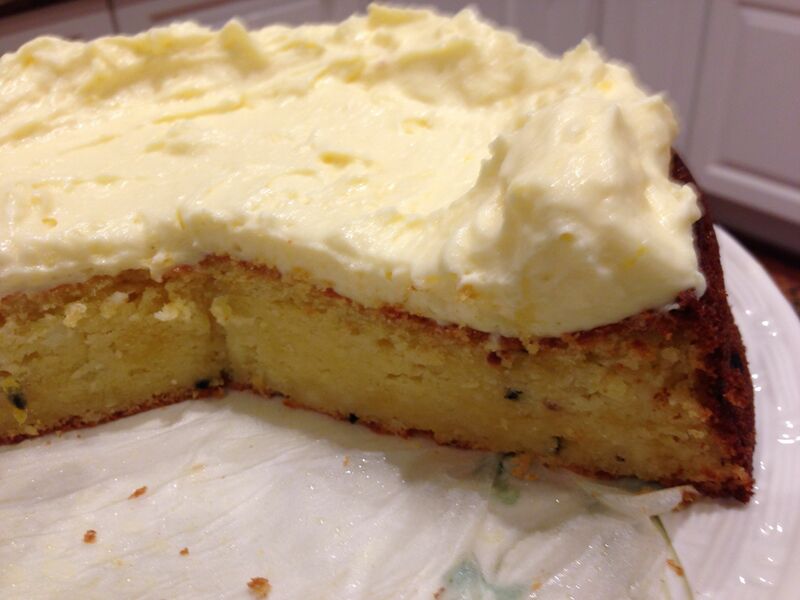 The standout flavour was the passionfruit – this was an inspired ingredient in this cake. The recipe comes from the magazine New Idea. My friend used her own recipe for lemon curd that she has been cooking for ever, handed down from her grandmother, a wonderful cook most fondly remembered by me. Place all ingredients in a saucepan over a low heat and stir until thickened. Cool before using. 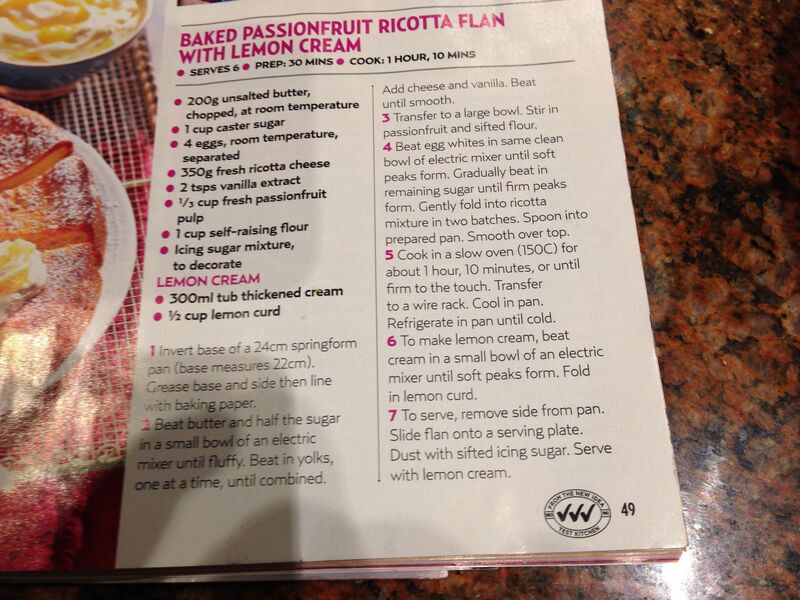 Serve the Baked Passionfruit Ricotta Flan with the lemon cream as topping and with ice cream! 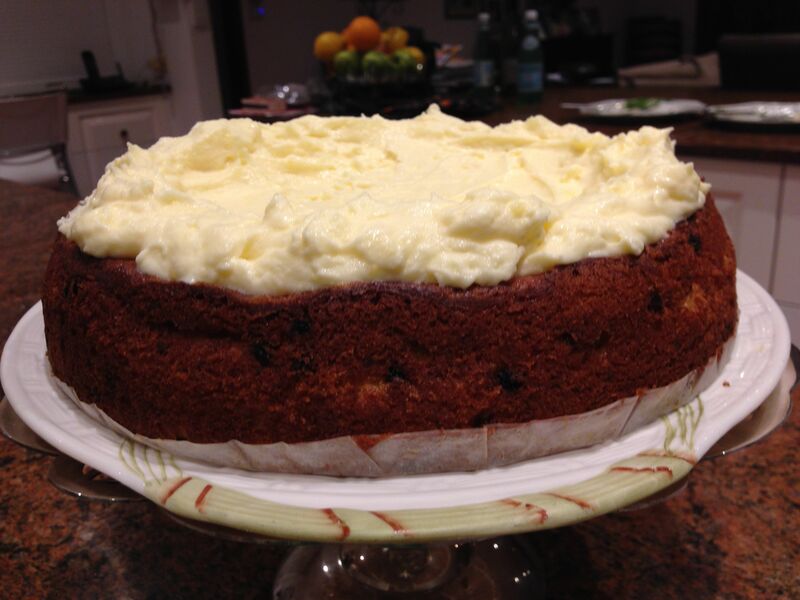 Posted in Cakes, Dessert, Sweet Food and tagged cake, cheesecake, flan, lemon curd, passionfruit, ricotta. Bookmark the permalink. Quinces are plentiful in the middle of Sydney winter. I can’t resist them. The kitchen is a lovely place as the scent permeates the house and the bright yellow of the fruit is beautiful to behold. I’ve been picking up a couple each week with my other fruit and veggie supplies. 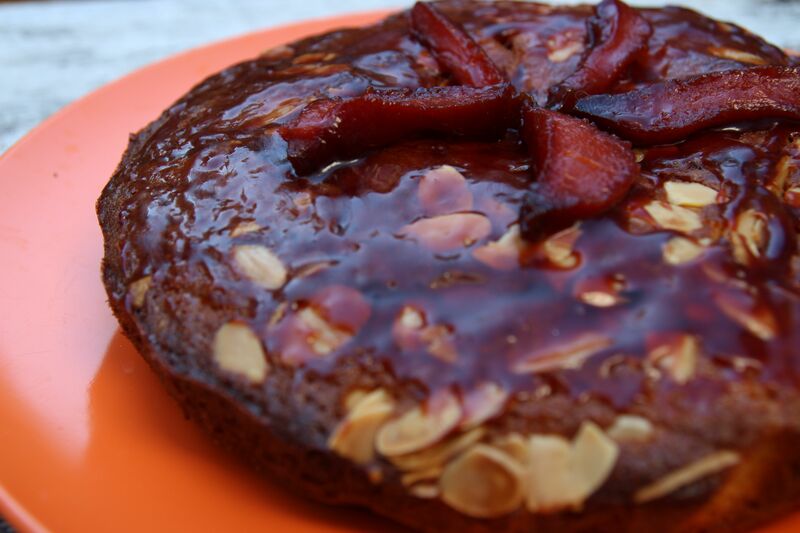 Baked quinces, quince crumble or this Quince and Almond Cake are yummy ways to eat the delicious fruit! I poached the quinces first in a caramelised syrup to intensify the “quince” flavour. Thank you to photographer and friend Nick for his title photograph. Preheat oven to 150 degrees C. Peel the quinces, halve lengthways and remove cores. Cut in quarters. Melt butter in a baking dish. Roll the quinces in the melted butter. 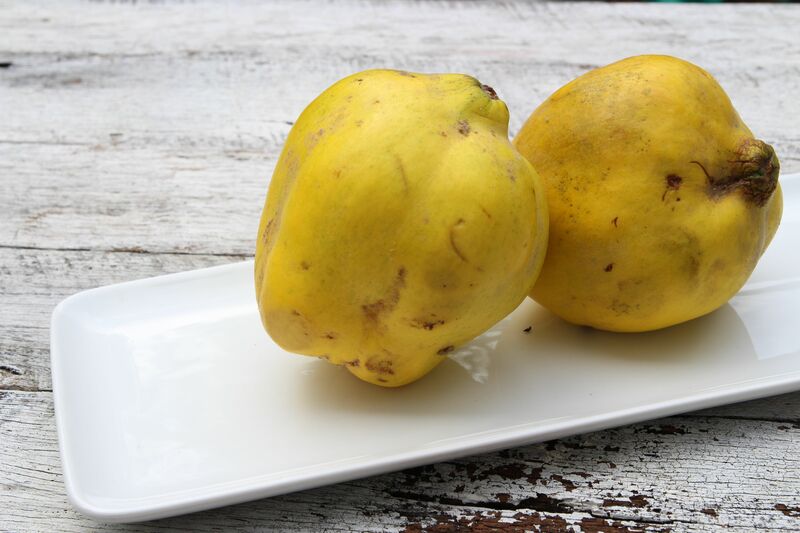 Scatter over sugar and squeeze the lemon juice over the quince pieces. Cover tightly with a doubled sheet of foil. Bake the quinces for 2-3 hours, basting every half hour or so, until the quinces are soft, ruby red and the pan juices are syrupy. Remove from the dish to cool, reserving some segments for decoration. Combine butter and sugar in a food processor, with vanilla extract and almond essence. Add eggs one at a time. Mix well. 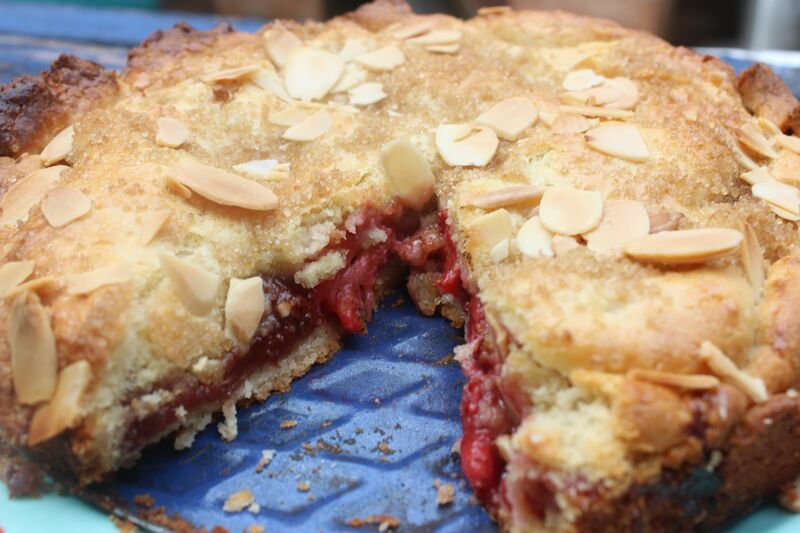 Fold in ground almonds, plain flour, baking powder and salt. Add a little more flour if the mixture looks too wet. Put mixture into a greased flan dish, or spring form tin lined with baking paper. It’s important to line the tin as the mixture can sometimes leak. Place quince segments on the top of the batter. 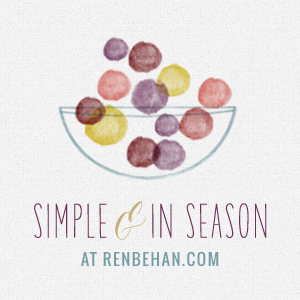 Don’t worry – the fruit will sink during cooking, that’s the effect you want. Scatter flaked almonds on top of the mixture. Bake in 170 deg C oven for 45 minutes or until a skewer comes out clean when inserted in the cake. 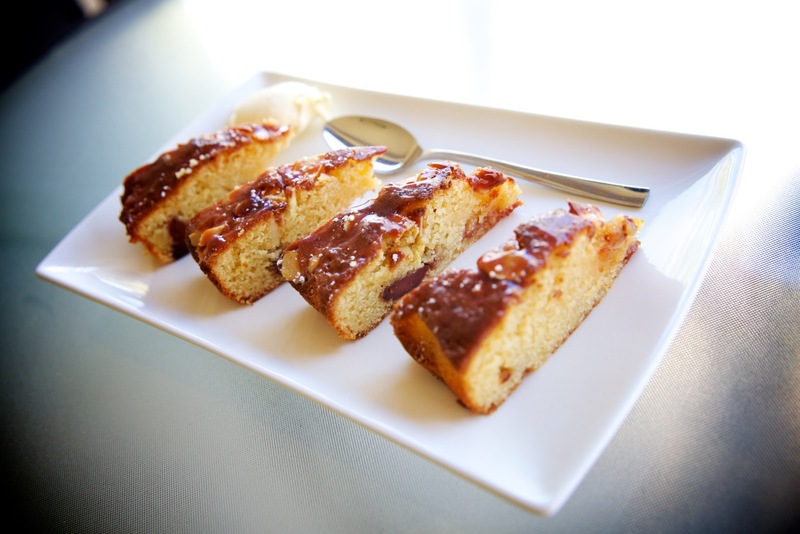 Spoon some quince syrup over the cake and decorate the cake with the reserved segments. 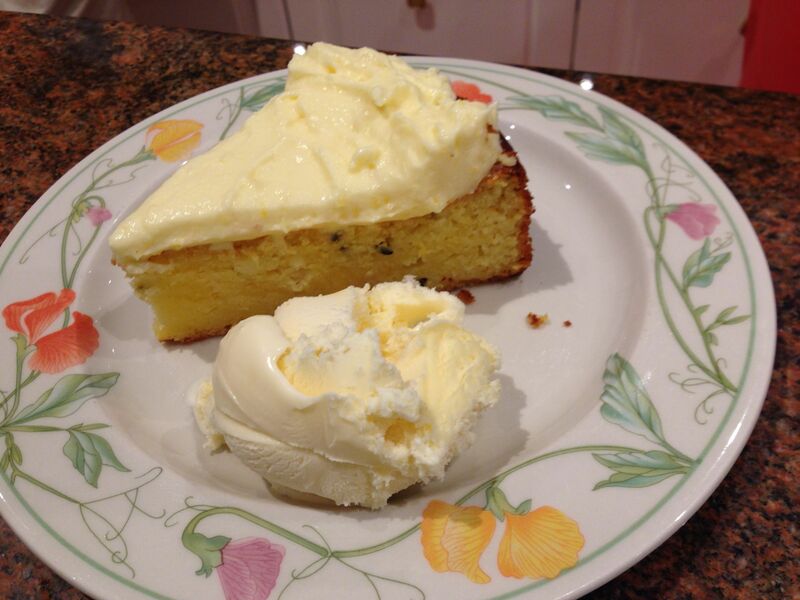 Serve warm or cold with double cream. Posted in Cakes, Dessert, Pies, Tarts and Quiches, Sweet Food and tagged afternoon tea, almond, cake, caramel, frangipane, quince, tart. Bookmark the permalink. 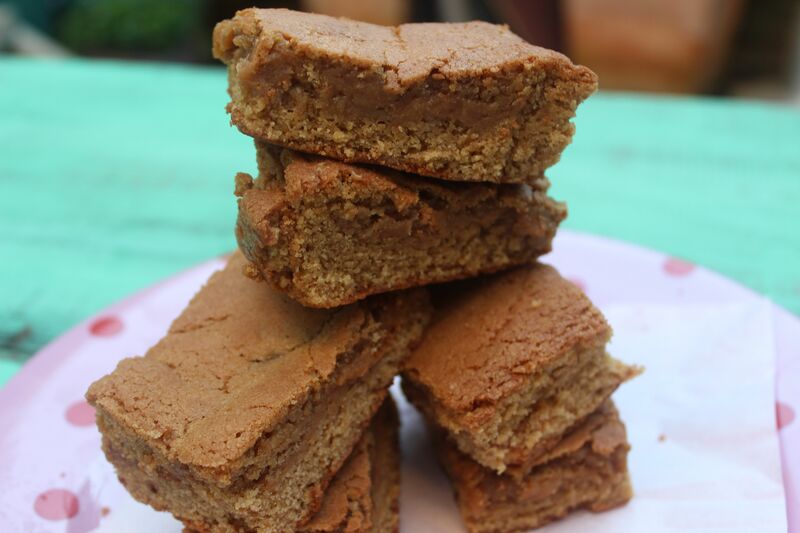 Salted caramel cake bar began life as a blondie, but on making it for the first time it was clear that the baking powder and the eggs make it much more cake like, and I have re-named it. Maybe it’s a cakey slice? Or a blondie cake? Preheat oven to 160 degrees C. Line a 22 cm square baking tin with baking paper. Put melted butter and brown sugar in a food processor and whizz until completely dissolved. Add the eggs and vanilla extract and mix to combine. Add the flour, baking powder and 1/2 teaspoon of the salt and fold gently with a rubber spatula into the mixture. Press half of the mixture into the prepared tin (it will be quite soft), smoothing the top with a spatula. Stir the remaining 1/2 teaspoon salt over the caramel. Pour the caramel on top of the mixture and spread in an even layer, leaving about a 1centimetre of space around the edges. Drop the remaining mixture in spoonfuls over the caramel and gently spread with the spatula until the caramel is covered. Sprinkle the mixture with a little sea salt if you want a really salty taste. Bake the cake bar for about 20 minutes, or until the top is brown and a skewer inserted into the bar comes out with just a thin coating of caramel. Cool the bar to room temperature, then refrigerate for at least 30 minutes to allow the caramel layer to set. Cut into squares to serve. 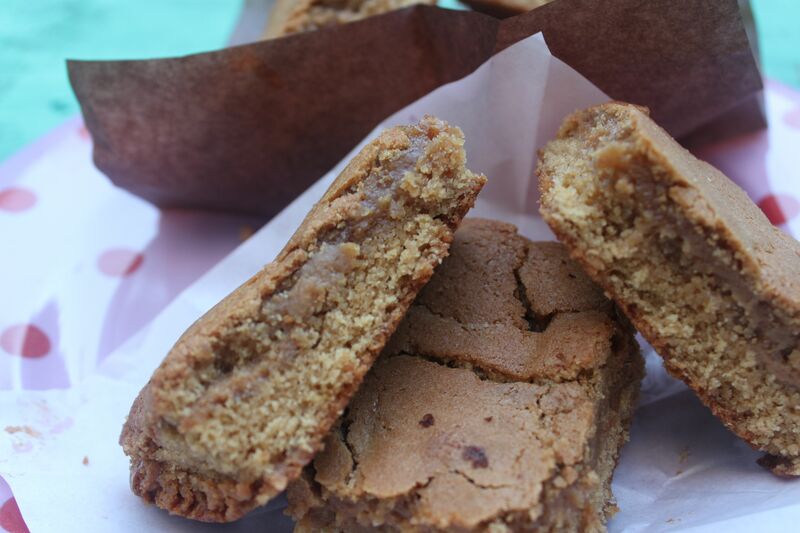 *Nestle Top Fill is great for the caramel. Posted in Biscuits and Slices, Cakes, Small Baked Things, Sweet Food and tagged blondie, cake, salted caramel, sea salt, slice. Bookmark the permalink. 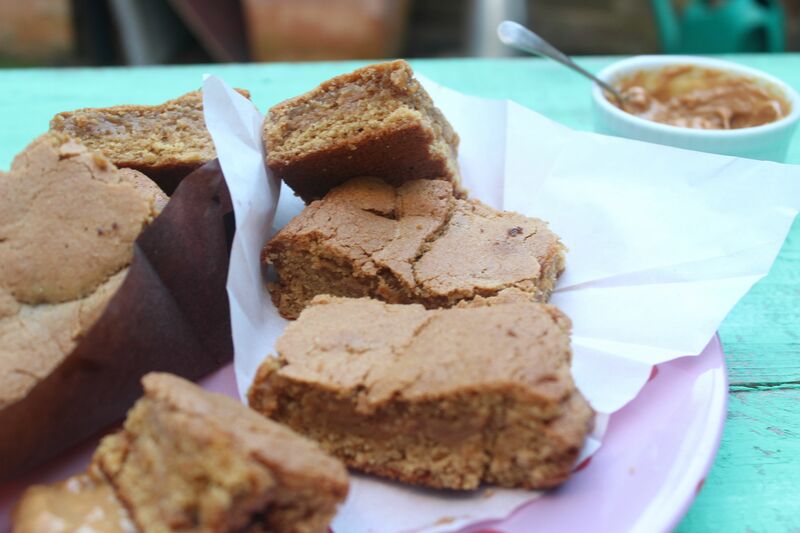 I cook lots and lots of cakes and this new recipe is very, very more-ish! Easy to make and great for afternoon tea or as a dessert. 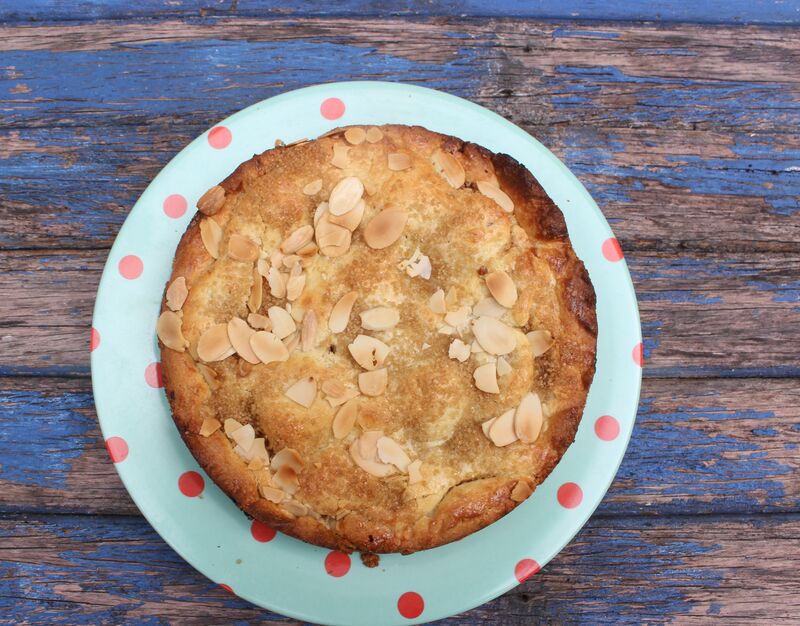 Bill Granger cooked a Pear, Blueberry and Almond Shortcake on the first episode of his television series Bill’s Kitchen Notting Hill, see below for the link to the series. I decided that the recipe would work just as well with strawberries. For a double strawberry hit, I cooked whole fresh strawberries and also added in a good dollop of my home made strawberry conserve. Place the butter, caster sugar and vanilla in a saucepan over a low heat. Cook, stirring for 1-2 minutes until the butter melts and sugar dissolves. Add the strawberries and cook over low heat for 8 minutes or until the strawberries are soft. 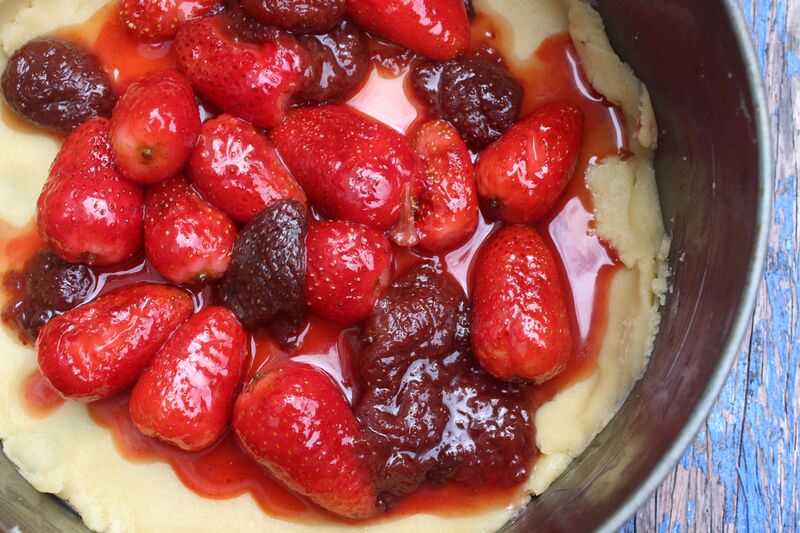 Remove from the heat and stir through the strawberry conserve, being careful not to break up the whole fruit. Set aside to cool to room temperature. For the shortcake, beat the butter and castor sugar until thick and creamy. Add the egg and mix well. Add the flour, almond meal and baking powder, then stir until combined. Turn onto a lightly floured surface and knead briefly to just bring the mixture together. Divide the dough in half, pat in to discs, then wrap in plastic wrap and chill for 30 minutes. Preheat oven to 160 degrees C. Grease and line a 24cm springform cake tin. On a lightly floured surface, roll each dough portion into a round about the size of the tin, then press one round into tin. Spoon the strawberry mixture and any juices over the dough, leaving a small border around the edge. Top with the remaining dough round and press the edges together to seal. 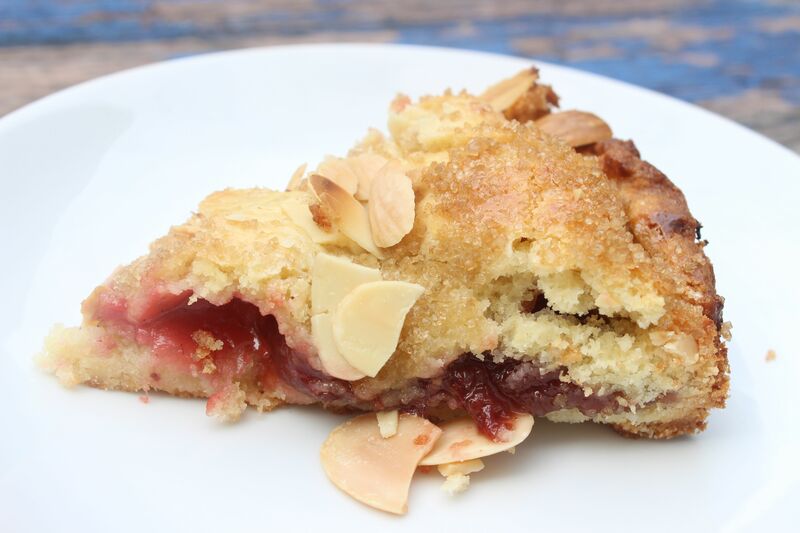 Brush with milk and sprinkle with demerara sugar and flaked almonds. Bake for 30 minutes or until until golden (cover loosely with foil if browning too quickly). Cool in tin for 20 minutes before carefully removing from the tin. Posted in Biscuits and Slices, Cakes, Dessert, Jams, Marmalades, Conserves and Chutneys, Pies, Tarts and Quiches, Sweet Food and tagged afternoon tea, cake, demerara sugar, pastry, pie, shortcake, strawberry conserve. Bookmark the permalink.